This modern house with its own garden has been specifically designed to meet the needs of the holidaymaker. It is perfect for a quiet relaxing vacation or as a base to enjoy wonderful scenery and exhilarating outdoor pursuits. The house is situated in the small village of Achnandarach, whose name means 'forest wind', and nearby there are stunning views over to Raasay, Skye and the mountains beyond. 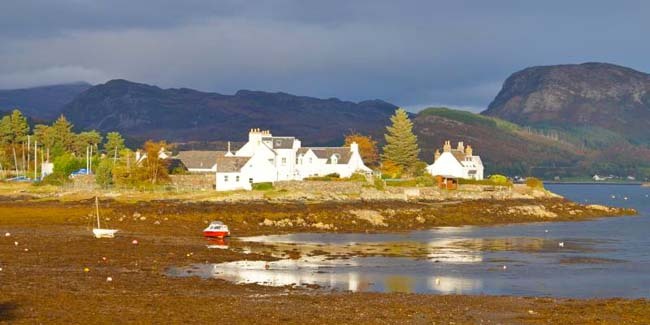 Only a mile away is the village of Plockton, regarded by many as the most attractive village in the West Highlands. Plockton is quiet through most of the year but is a popular destination for visitors in the summer months, particularly during its long established, small boat sailing regatta fortnight in August. There are many fine, low level and coastal walks in and around the village where otters and birdlife can be spotted. For the more active, sailing, kayaking, mountain biking, fishing and hill walking are particularly popular, with Torridon and Kintail only a short journey away. The Plockton district is an area with interests for everyone. Visitors can enjoy the romantic Eilean Donan castle, the Lochalsh Woodland Garden at Balmacara (maintained by the National Trust for Scotland), or the remote coastal settlement of Applecross reached by a memorable journey over the highest road in Scotland. Locally landed seafood and Plockton brewed ale can be enjoyed all year round in several local inns and restaurants. At nearby Kyle of Lochalsh is the bridge over to the beautiful Isle of Skye which boasts spectacular mountain, cliff and seascapes and some unique geological formations. From there, take a boat trip from Elgol to spot seals, dolphins or whales or to visit the elusive and magical Loch Coruisk in the heart of the Cuillin mountains. Visit the Talisker Distillery or one of the many artist studios or enjoy a meal at the world famous Three Chimneys restaurant. Swim and picnic at the enchanting Fairy Pools before returning to your very comfortable holiday house at Plockton! Tulachbeag is a modern holiday house: the theme is luxury with a contemporary feel. 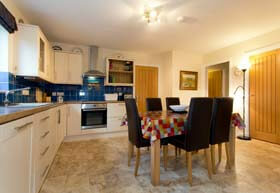 Bright and spacious, the kitchen, dining and living spaces are open plan. There is a separate utility room too. 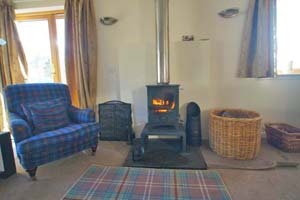 The sitting-room boasts a lovely multi fuel stove for the cold evenings and for the warmer weather enjoys patio doors which open out to the garden. The cottage has three bedrooms. 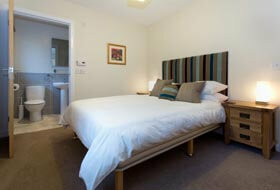 Two of the bedrooms are doubles (one with en-suite facilities) and a further bedroom has bunk beds. 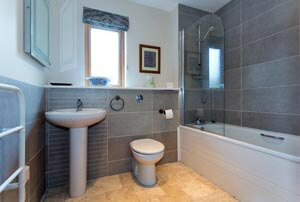 The main bathroom has both a bath and shower. Outside, the gardens and patio areas have garden furniture and there is a barbecue/fire pit, ideal for dining alfresco in the summer months or sitting round the fire pit all year round and star gazing, far away from light pollution. The surroundings are very quiet and there are fantastic walks from the doorstep. Alternatively you may well wish to sit back, enjoy the tranquility and watch the resident wildlife. From the Kyle of Lochalsh take the road to Plockton. Follow this road until you come to Diurnish. Go through Diurnish and turn left over the bridge. Follow the road for a quarter of a mile and then turn right following the sign for Achnandarrach. Follow this road for about half a mile and take the next right turn. Follow this road for a few hundred yards and the house is the last in a line of houses on the left. Electricity is included and all linen and towels are provided. The house is rented out throughout the year. Change over day is Saturday. Short breaks available out of high season. 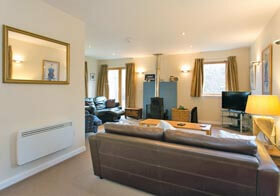 To book this spacious holiday home near Plockton, click the enquiry button below and see availability and prices. This is a fabulous part of Scotland for a Plockton holiday - with its own micro climate, sandy beaches, amazing wildlife (a boat trip to spot seals is a must) and glorious countryside to walk or climb in. This superbly appointed house is a perfect place to relax in at the end of the day - or indeed spend all day there admiring the amazing views to Skye!